Tarboro, NC Bojangles'® Tands, INC. Store #27 - Bojangles'® / Tands, Inc.
Bojangles’® loves being a part of and serving the great community in Tarboro, NC! Our Market Center Dr. Bojangles’® location is the perfect place to take a rest stop and enjoy great food with family or friends. 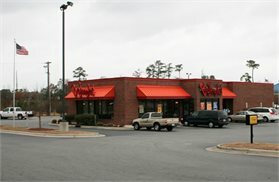 Bojangles’® is located in the heart of Tarboro, NC and its new, thriving retail area. Swing by to go shoppigng and stop into Bojangles’® for the southern food you crave: biscuits made from scratch, fried Cajun chicken, fixin’s like mashed potatoes and Cajun Pintos®, and more! For breakfast, lunch and dinner, Tarboro, NC loves the bold flavors and satisfying food at Bojangles’®.